Service Design can no longer be considered an ‘emerging discipline’. Though recent and in continuous evolution, it is now consolidated enough to be assessed and reviewed in terms of effectiveness and impact on economy and society: how far has the logic of services (and of Service Design culture) influenced the different domains of innovation and value creation? How much has this been truly integrated into the innovation process of private and public sectors? How effectively has this been understood, evaluated and discussed? How far have digital technologies and media been influencing service design and delivery? This is the theme of ServDes. - Service Design and Innovation Conference, the most important conference about Service Design worldwide. The conference is happening every two years and this time it will be hosted by Politecnico di Milano and POLI.design on 18-20th of June! 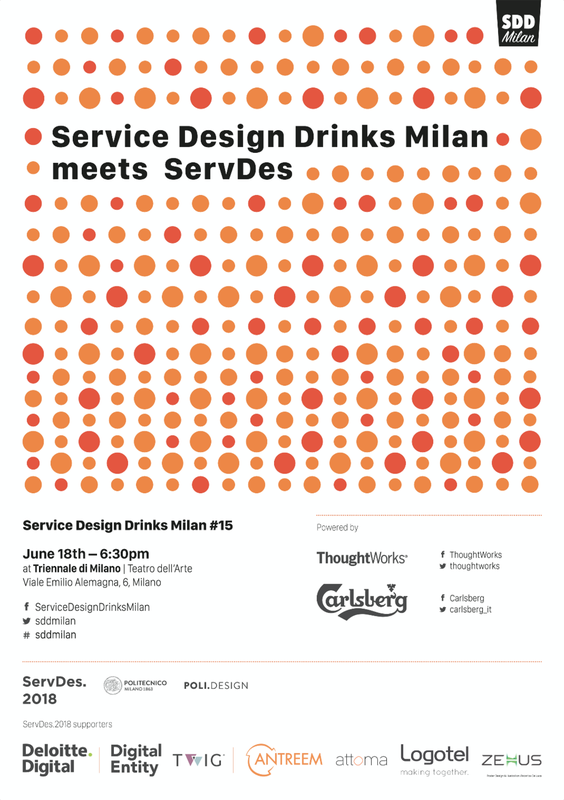 For the next “Service Design Drinks Milan #15 - Service Design Drinks Milan meets ServDes” we are pleased to open the conference and give the opportunity to our amazing community to have a glimpse on the contents that will be shared during the following days.